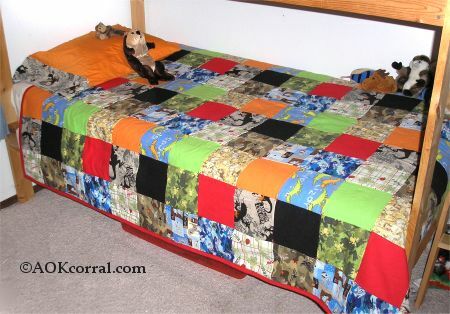 Make a comforter for a baby crib or a twin, full, or queen bed. Complete instructions for making this quilt style, cozy comforter. The PDF Version contains all instructions and diagrams to make crib, twin, full or queen size comforter as well as tutorials for grain, cutting, and binding. The Easy Print Version contains all the instructions and diagrams for crib, twin, full, and queen size comforters as well as tutorials for grain, cutting and binding. Our quilted comforter is made using 6 ½” cut squares, which become 6” squares when stitched into the comforter. 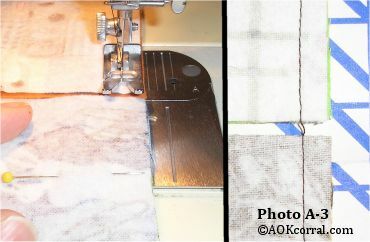 All seam allowances (raw edge beyond stitching) are ¼” unless otherwise stated. Batting should be purchased as a complete comforter size piece. To figure out how much fabric you need of each color, you should make a rough design plan. A good way to plan out your design is to use a piece of graph paper and trace out the correct number of squares for your comforter size. Color in the squares until you come up with a design you like. You can refer to our comforter diagram for layout of squares to help with your design. If your fabric has lines or directional prints, you will need more fabric for cutting the squares correctly in the pattern. Good fabrics are flannel, quilting fabrics, cottons, and cotton blends. These amounts assume your fabric is 42" to 45" off the bolt and may shrink a bit. *Important: WASH and IRON ALL fabric before you begin cutting! Cutting Fabric on the Grain. 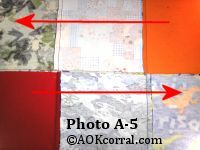 How to Cut Quilt Squares and Strips. 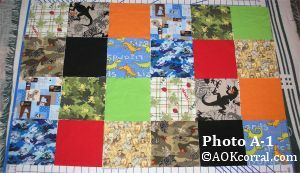 Cut squares: All squares for this comforter are 6 1/2 inches. Cut 180 squares in total. Cut binding: Cut binding strips along the lengthwise grain. Strips should be cut at 3 inches wide. When cut at 36 inches long, you should need 10 strips. Cutting backing: Cut off selvages to prepare for stitching. Lay your fabric on a table or floor. Measure and mark about 1 inch from the selvage edge at intervals of 10 to 20 inches along the full length of the side. 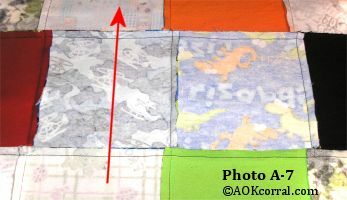 Slide your cutting mat under your fabric and line up the edge of your quilter’s ruler with several of the marks along the side. 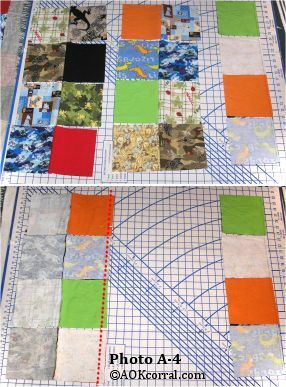 Using your rotary cutter, cut along the ruler, lining up marks and adjusting the fabric as you go. Open out stitched vertical columns and place in their correct design positions again. Stitch on a continuous thread as before. Repeat until the whole section is stitched together with continuous threads in vertical columns. Next you will stitch together the horizontal rows in your section. Fold two of the horizontal rows of squares with right sides together. Repeat steps 11 and 12 for each horizontal row until the section has been completely stitched together. Create all other sections using steps 1 through 14. To complete the top of the comforter you will need to combine all your sections into one completed comforter top. Refer to your design plan and lay out all the completed sections to their correct positions. After stitching, open out seam allowances and press with an iron. Continue joining all left and right sections with vertical seams and press out seam allowances. Lastly, you will need to join all segments with horizontal seams. Lay out your segments in their correct design placement again. Put right sides together and match up squares and seams. 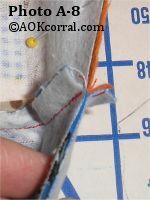 Pin together and stitch horizontal seam. Repeat for all additional horizontal seams needed to complete the comforter top. Press these last horizontal seams up toward the top edge. Pin the backing pieces with right sides together and raw edges even. Stitch the pieces together with a ½” seam allowance. For larger comforters, requiring more than two widths of fabric, repeat these steps for the additional piece. Spread out the seam allowances and press flat with your iron. Excess fabric will be trimmed off after the comforter is assembled. Prepare a large work area such as a clean floor. If you have a fold-out, cardboard, fabric cutting board, you should set that out in the middle. Lay out your backing with the wrong side up and smooth out any wrinkles. Open up your poly-fil batting and lay it out, centered over the backing fabric. Be careful not to wrinkle the backing. Make sure that you can see the backing fabric on each side so you know that your batting is centered. Smooth out the batting, starting from the center and smoothing out to all edges. Check to make sure that the batting still fits within the backing fabric edges. If not, redo. Lay out your comforter top, right side up, onto the batting. Be careful not to wrinkle or move the batting. When you have all layers together, begin pinning them in place through all thickness, starting with the center squares and pinning away from the center, up and down and left to right in the form of a cross. Continue pinning the layers together so that there are pins in every square through the cross and around the edges, and pins in every other square throughout the rest of the comforter. When finished, fold the comforter and check to make sure that your backing is smooth. If you find wrinkles or bunched up fabric, you will need to remove the pins and re-assemble the layers. 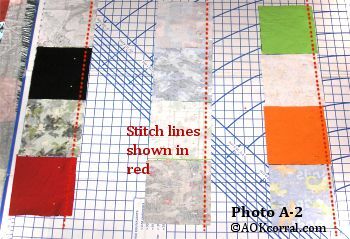 To join all the layers together you will stitch a simple X with embroidery floss at each square intersection. Use the embroidery floss “as is” with all strands intact. You will stitch your X tacks in a similar order as you pinned the layers together. Start from the center and work in a cross, left to right and top to bottom, for several intersections, then fill in the others in between. Your work will shape out like a diamond as you go along and you will finish with each corner area. Lay out your cardboard fabric board on a large bed, then lay out your comforter on the bed. Stitch the X with ½ inch long stitches being careful not to pull tight as that may cause the fabric to bunch up. Roll the comforter up enough for you to see the back of your stitching. Tie the two ends in a secure knot and trim the ends. Complete X tacks throughout the entire comforter. To finish the edges of your comforter you will add a binding around the outside edges. A binding is a strip of fabric that closes in all the unfinished edges on a quilt/comforter. To additionally prepare your comforter for sewing on the binding you will need to add a basting stitch around the outside edge. Prepare a needle and a long piece of sewing thread. Lay your comforter out on a large bed and smooth it out. Stitch, 2 inch long, running stitches through all thicknesses at about 1-2 inches from the edges of the comforter. Continue all around the comforter. Lay your comforter on top of your cutting mat on the floor or a large table. Using your ruler and rotary cutter, carefully trim off all excess batting and backing fabric along the edges of the comforter by lining your ruler up to the comforter’s quilted top edge and cutting the other layers to match. You are now ready to add a binding to your quilted comforter. Go to our page on How to Bind a Quilt for the directions on finishing your comforter with a quilt binding. Make a crib comforter for the next baby shower you attend, or make bed comforters for your whole house. 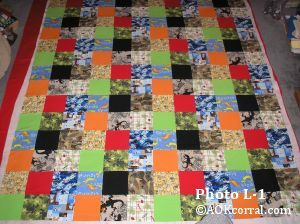 © Copyright 2012 by AOK Corral Craft and Gift Bazaar. All rights reserved. The Easy Print Version contains all the instructions and diagrams for crib, twin, full, and queen size comforters as well as tutorials for grain, cutting, and binding.